How much does it cost to do a bikepacking race? This is a question that is often asked but is very difficult to answer. Having kept track of most of my major direct costs (travel, accomodation, food and training trips) for the 2016 Transcontinental Race, I hope to give a somewhat informed estimate and expected range. I spent a total of €450 on travel from my home in Switzerland to and from the 2016 Transcontinental Race (TCR), including extra fees for the bike. Getting to the start in Belgium involved taking three trains and getting home from Turkey involved a bike ride, a ferry, a taxi, a plane, and a train. Obviously, these costs will vary depending on where you live, how you choose to travel, and where the start and finish are. Someone who lives close to one end of the race might be able to spend only €200, someone who lives on the other side of the world might need to spend €1500. For most people living in Europe, around €300-500 is reasonable. The total cost for my race registration, insurance, a medical certificate, and a Turkish visa was €390. My costs were higher than many others because I had to pay to get a medical certificate and many of the cheaper insurance plans are not available to people living in Switzerland, so I expect that many people paid closer to €300. The costs for accommodation and food will vary depending on the number of days taken to complete the race. I left home one day before the race started, took 13 days to finish the race, then stayed at the finish for three nights until the morning after the finish party and flew home from Istanbul the day after that. I was therefore away for 18 days, which is quite typical for the average TCR finisher, so is what I give estimated totals for below. Sleeping Strategies are discussed on another page. Personally, I stayed 1 night in a hotel before the start of the race and 3 nights in a hotel at the finish plus 6 nights in hotels during the race. These 10 nights cost me a total of €420, with a range from €12 for a night in Montenegro to €120 in Switzerland, so an average of €42 per night when in a hotel. There were 8 nights when I spent nothing on accommodation: 7 nights when I bivvied outside and one night in Istanbul airport before my morning flight home. My overall average cost for accommodation per night was therefore €23. I was quite frugal and lucky with the prices of the hotels that I found and used hotels sparingly. 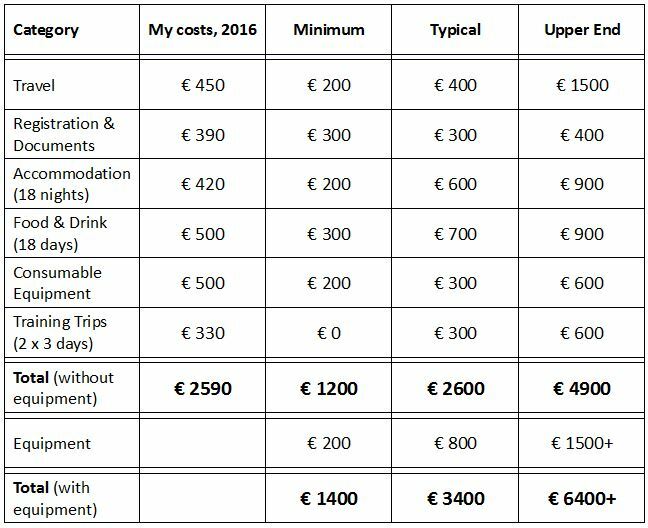 Other people might average up to €50 per night and stay in a hotel every night, making a possible total of €900 for a similar length of trip to mine, but €600-700 might be around average. Everybody spends at least a few nights in a hotel before, during, or after the race, so I estimate that the minimum accommodation cost would be about €200. Nutrition, Food & Fueling Strategies are discussed on another page. Personally, I purchased most of my food and drink at grocery stores and petrol stations. Having plenty of extra space in my bags for food and three large water bottles meant that I could take advantage whenever I found a good shop. I estimate that I spent about €20 per day at grocery stores and petrol stations while in western Europe and €15 per day in south-eastern Europe. I only ate 7 times in proper restaurants and 11 times at fast food restaurants / cafés during the 18 days (including before and after the race), which cost me a total of about €200. My total cost for food and drink was therefore about €500 in 18 days, or €28 per day. Most other racers eat a lot more meals at restaurants than I did and buy more food at petrol stations than supermarkets, so I expect that this cost could be at least 50% higher for many people. It would be difficult to economize much because you need to eat a lot to keep your energy level up all day and you don’t have much time to shop around to find the best prices/value. A range of €15-50 per day on food is therefore probably realistic, which gives a range of €300-900 in total, with around €700 probably being quite typical. I cover Equipment Costs (i.e., the bike, accessories, clothing, sleeping gear, gadgets, etc.) on the next page because those costs are more indirect and are extremely variable based on your preferences and what you already own. 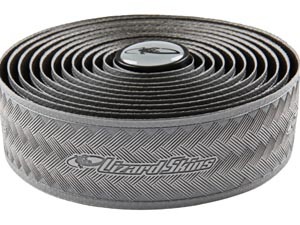 However, there are certain pieces of equipment that are consumable and wear out or need to be replaced during training and the TCR, and so the cost of these consumables can be considered to be a direct cost of doing and preparing for the race. These consumable items include bike tires, inner tubes, chains, brake pads, water bottles, handlebar tape, batteries, and toiletries. I also include the extra cell phone costs accrued during the trip in this total because there is no better category to put it in. I therefore estimate the total cost of consumable equipment to have been about €500 for me. Other people could probably economize here due to alternative equipment choices and making things last longer and so may only spend about €200. I don’t expect that many people will exceed €600 in this category unless they break or lose something expensive during the race (which is certainly a possibility). I strongly encourage people to do some Multi-Day Training Rides while preparing for the race. These are not as much about physical training, but more about experiencing what it will be like to do this style of riding – learning about the Mental Approach & Strategies that work best for you, trying different Nutrition & Fueling Strategies, testing your Bike & Components and Accessories, discovering Comfort issues, etc. Hopefully these trips will illustrate problems that could cause you to scratch from the race while you still have time to address them. The costs during these trips will be similar to those during the race itself, so you can expect to spend €50-100 per day on food and accommodation, plus possibly the cost of transport either to the start or from the end (the further you get away from home, the more realistic it will be). A couple of 2-3 day trips could therefore cost €200-600, but someone looking to spend the minimum possible could decide not to do such trips. Personally, I did three trips like this leading up to the 2016 race, with a total length of about 8 days. During this time, I spent two nights in hotels (total cost = €80), two nights with friends, and two nights bivvying. I took four train rides to get to the start or back from the end of each ride for a total cost of €100 (two rides started or finished at home). During the 8 days of cycling, I estimate that I spent €150 on food (slightly less per day than during the TCR because I took about one day’s worth of supplies with me from home each time). My total costs were therefore €330. As shown in the table below, my total costs of doing the TCR 2016 (not including equipment costs) were about €2590. I expect that the average participant may have spent a bit less than me on consumables and registration/documents but a bit more on food and accommodation, so may spend a similar total of around €2600. Someone who used hotels and restaurants even more could easily spend well over €3000, and still more if they had to travel to the race from outside of Europe. The minimum costs listed in the table really are the lowest possible values – you would need to base nearly all of your decisions purely on cost to achieve these amounts and I don’t expect that there are many people who could get very close. In reality, trying to spend less than €2000 would be a more achievable goal. These estimates should be reasonable for anyone who finishes the TCR in 12-16 days, which is historically at least two-thirds of all finishers or about half of all starters. People who take longer can expect to spend more on food and accommodation, with the costs likely to increase at a rate of €50-100 per additional day. About one third of all starters do not finish and ‘scratch’ from the race. How the costs will be affected depends on when the person scratches and what they decide to do afterwards – go back home or find another way to get to the finish. Overall, I don’t expect that the costs for someone who scratches in the middle of the race will be very different to someone who finishes the whole race; that was certainly true for me when I scratched just before halfway through the 2015 TCR, but still went to the finish, compared to when I finished the race in 2014 and 2016. Equipment that is purchased to use during these races can also be used outside of the races and so it is an indirect cost, which is why Equipment Costs are covered separately on the next page. Equipment costs are extremely variable depending on what you already own, the money you have available, and what level of equipment you choose. To summarize the detailed breakdown that I perform on the next page, I estimate that the typical amount spent on new equipment for most riders is in the range of €200-1500, with €800 being my best guess for what is most typical. If a complete new bicycle is bought for the race then that cost would be in addition to these values. The total cost of doing the TCR including buying some new equipment is therefore estimated to be an absolute minimum of €1400, a more achievable low-end of €2000-2500, but more typically around €3000-4000, and occasionally well in excess of this (especially if traveling from outside of Europe or if a new bike is bought). In my opinion, this is money well spent to have an incredible adventure, meet amazing people, and to experience living life to its fullest. It also gives you something special to focus on for many months beforehand and to reflect upon afterwards. It’s hard to put a monetary value on most of these things, so hopefully the cost won’t stop you from giving it a go and this page will allow you to manage your finances accordingly. The other page in this section contains cost estimates for typical bikepacking equipment, which is even more difficult to estimate than the costs involved in doing a race.